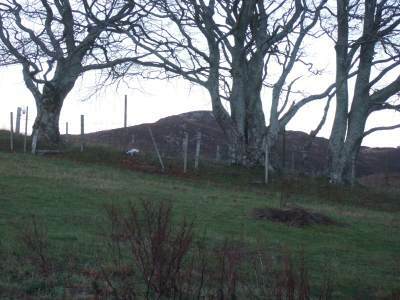 According to the historical and traditionary sources, Raghnall Mac Ailein Òig lived for much of his life at Cross in Morar. Cross House was the ancestral seat of the MacDonalds of Morar; Ranald’s father and two brothers as successive chiefs would usually have lived there. We know nothing about what Cross House was like in Ranald’s time. There is evidence for the house being rebuilt in 17361, most likely after his time there. The house was burned by British government soldiers in 1745, because the Morar MacDonalds were known Jacobite sympathisers. 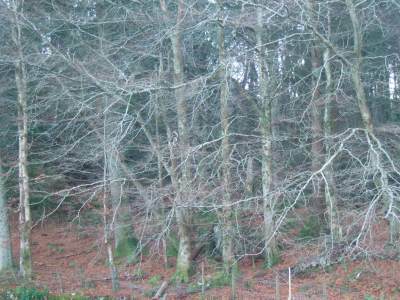 When Prince Charles was in hiding in the area he crossed the Morar River and made his way to Cross seeking shelter, but he found a burned ruin. 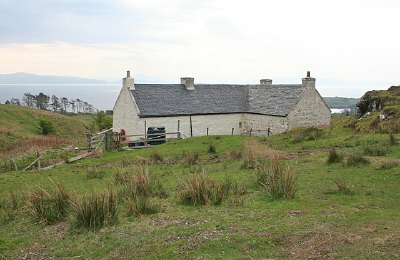 The house must have been rebuilt after the ’45, as it remained the chief’s house in Morar for another generation or two. 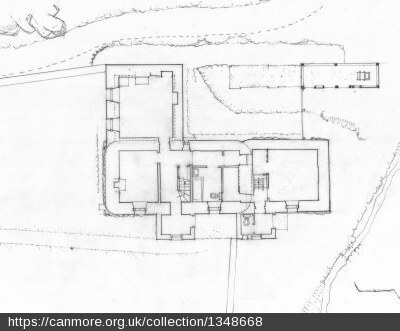 Cross House was demolished some time after 1784, when the seat of the Morar MacDonalds was moved to Traigh House, a few miles south2. 50 years later, no trace of it remained on the ground. The old house at Cross was described as stone built, thatched and gabled3. As far as I can tell from old maps4, Cross House might have stood on the north bank of Allt Cuairteach, (Courtack stream) which runs through the hamlet of Glenancross. Approximately at the possible site of Cross House, looking East. Alternatively, Alasdair Roberts5 suggests that the ruins of a house higher up the glen above modern Glenancross may be where Ranald lived. 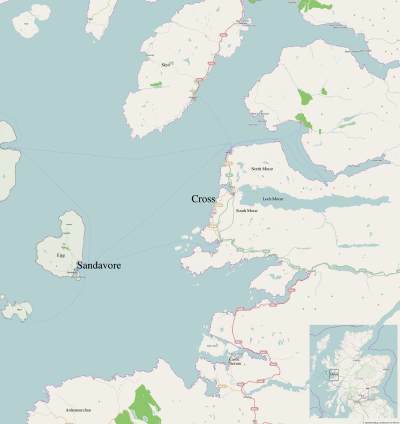 Ranald was living at Cross in 17056, but at some point before or after that date, the Clanranald chief is said to have granted Ranald the farm of Sandavore on the Island of Eigg. Sandavore farmhouse is still standing8. The original three-bay stone house had just two ground floor rooms. Its rounded corners suggest it may originally have had a hipped roof, without gable ends. Gables were added at some point, and then later heightened. At some point, probably in the late 19th century, the house was extended at the north end and out from the south-west corner to make the current L-shaped plan. 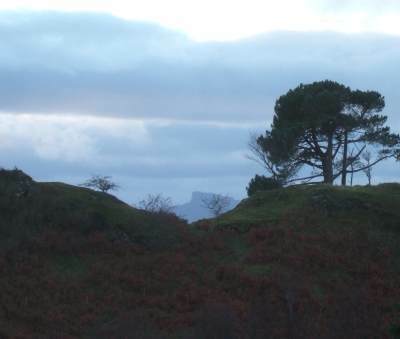 View from the rise above Cross, showing the Sgurr of Eigg, the ridge which runs behind Sandavore farm along the length of Eigg. 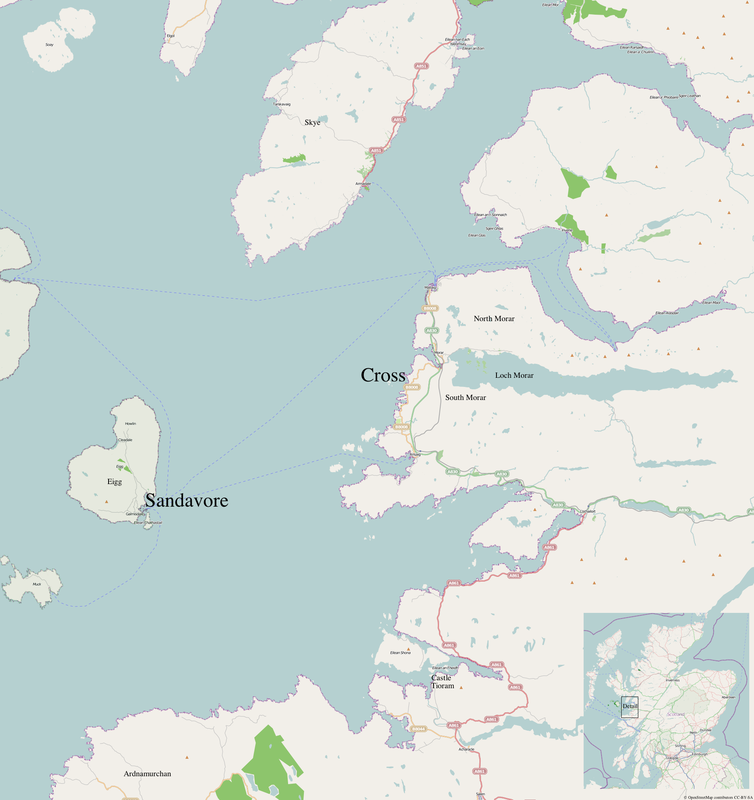 Map of Morar and Eigg. Click to enlarge.